We can supply a more effective way to ship larger quantities of material with our intermediate bulk containers. They come in 275 gallon and 330 gallon sizes. Intermediate bulk containers are used to transport fluid or bulk materials, and can also be used for storage. Intermediate Bulk Containers are made to protect the product in all climate conditions, and ensure safe loading, with minimal handling. These containers are easy to fill, stack and load, making the shipping process more convenient and cost effective. They remain sturdy when transporting, ensuring a safe delivery of the product. 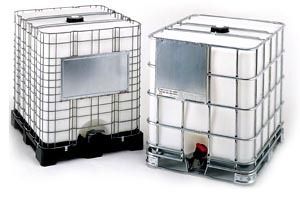 We supply new, rebottled and reconditioned Intermediate Bulk Containers. Reusable containers provide lower packaging costs and are environmental friendly.